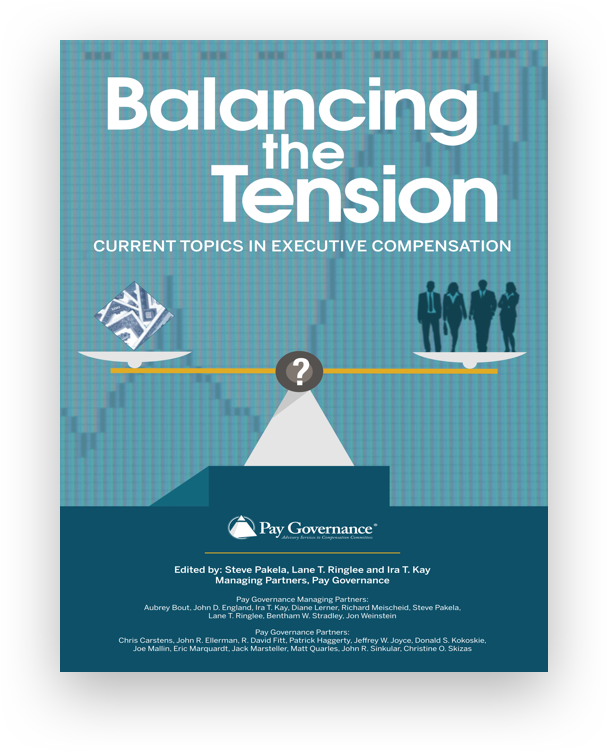 ISS uses TSR as the sole metric in its key SOP quantitative test of the “alignment” of CEO pay and performance relative to peers. This has received some valid criticisms from companies and shareholders. The use of TSR as the sole alignment metric has pressured many companies to utilize relative TSR as a performance-vesting condition in their performance share plans. In response to such criticism, ISS has incorporated GAAP financial metrics into their qualitative P4P evaluations. ISS is considering incorporating these additional metrics into their quantitative assessment. This new approach addresses some of the criticisms of TSR but also creates new, significant challenges. This could create additional pressure on companies to incorporate the ISS selected financial metrics into their incentive programs. 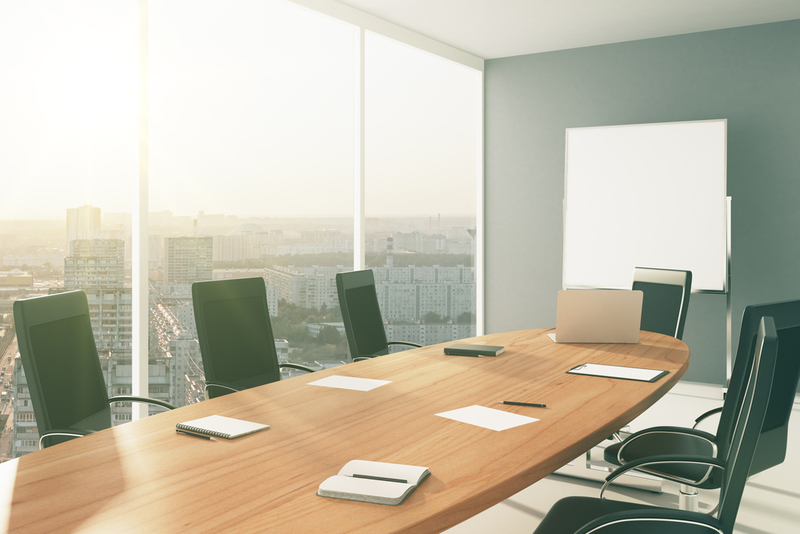 Instead, companies should continue to focus on metrics that are relevant to their business strategy, shareholder alignment, and executive motivation. 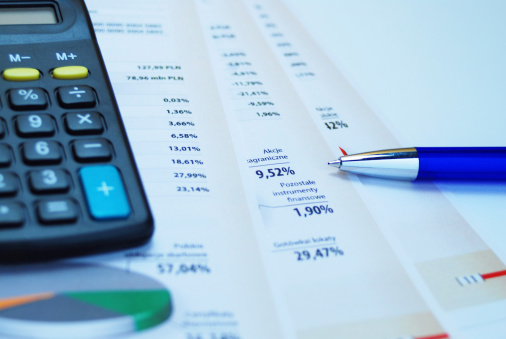 Non-GAAP metrics, strategic objectives, or other GAAP metrics not reviewed by ISS may be more relevant for a company’s specific circumstances. These metrics could also be much more motivational for focus and controllable/core earnings growth. Recent academic studies and research support the relevance and use of non-GAAP/adjusted earnings over GAAP earnings. Companies will need to make the case to shareholders in their CD&A to justify the appropriateness of the company-selected metrics. Over time, focusing on the company-specific drivers of value creation will translate into shareholder value creation and positive SOP outcomes. Say on Pay (SOP) and shareholder advisor vote recommendations have caused a dramatic increase in the use of relative total shareholder return (TSR) as a long-term incentive (LTI) plan performance metric. Relative TSR prevalence in LTI plans has nearly doubled over the past 5 years, used by approximately 50% of companies of all sizes and industries. This is largely due to shareholder advisors, such as Institutional Shareholder Services (ISS), using TSR as the primary metric in their relative pay for performance (P4P) quantitative evaluations. ISS is appropriately attempting to enhance its company performance assessment model by adding 6 metrics.1 This new approach is clearly a response to critics, but it presents a new set of challenges. ‍Limited line of sight: TSR measures the final outcome of a management’s strategies and efforts to create value for shareholders. TSR or target stock prices may be a powerful incentive under specific circumstances; however, TSR does not provide specific direction or motivation towards management’s priorities: the drivers of value creation as well as strategic and operational areas. Relative TSR, as an incentive metric, has even lower direct motivational power. Outside factors: There are multiple factors beyond the management team’s control that impact TSR: even successful management efforts do not always translate directly into superior TSR performance. Management could do everything right to drive value creation, but other macroeconomic or industry sector factors could negatively impact short-term stock prices. Conversely, management could destroy enterprise value through strategies that generate returns below the cost of capital while other factors create a positive stock price swing. 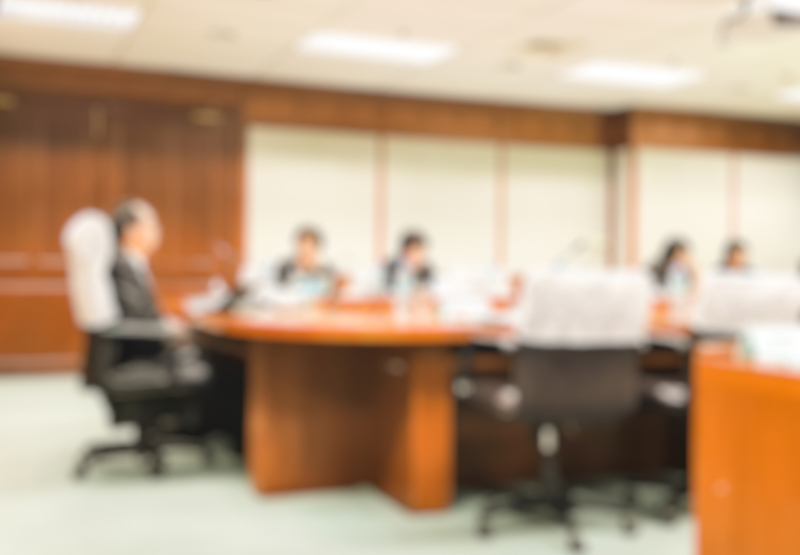 The Investor Responsibility Research Center4 has demonstrated flaws created by the shareholder advisors’ focus on TSR as the primary basis for SOP vote recommendations. Relative TSR has its own set of complications. In response to such criticisms, ISS has incorporated additional Generally Accepted Accounting Principles (GAAP) financial metrics into the qualitative component of their relative P4P evaluations. ISS 2017 policy survey results show that the majority of investors and issuers support — or strongly support — incorporating other financial metrics into the quantitative assessment of CEO pay and performance.5 While it is reasonable to incorporate additional metrics into a P4P assessment, a rigid and standardized approach for thousands of companies could cause substantial “false negatives” (low GAAP performance when there is high adjusted performance and/or rising stock price). For the 2017 P4P assessment, ISS has incorporated 6 financial metrics as part of its qualitative assessment. The metrics include Return on Invested Capital, Return on Equity, Return on Assets, as well as Earnings before Interest, Taxes, Depreciation, and Amortization (EBITDA) growth, cash flow growth, and revenue growth. The specific weighting given to each metric will vary by industry. Undisclosed weightings are assigned to each metric used based on the subject company’s industry and the corresponding ranking of each metric. The metrics are ranked in order of priority/relevance for each industry. ISS will use reported GAAP results rather than adjusted performance results. There are obvious efficiencies and advantages to this, but the particulars of each company could be lost in the shuffle. However, the vast majority of companies use non-GAAP (adjusted) results in earnings releases and incentive plans.6 As has been demonstrated repeatedly, this trend has been endorsed — with caveats — by analysts and shareholders. Research and experience indicate that adjusted results are correlated more closely with stock price performance than with GAAP. While this methodology change addresses TSR’s “one-size-fits-all’ problem, it creates more problems than it solves. First, business model differences caused by strategic differences, technology disruptions, global markets, regulatory pressures, etc., can be significant enough to prevent valid company-to-company comparisons from a preselected set of rigidly-defined metrics and their actual GAAP performance levels — even between companies in the same industry.7 Second, ISS’ imprimatur of a metric could encourage/ pressure companies to choose that metric in their incentive plans — similar to the surge of relative TSR in LTI plans. This selection could be made despite a metric’s lack of strategic fit and other disconnects. Our experience is that the vast majority of companies choose the metrics used in their incentive plans carefully; our concern is that these ISS/SOP issues could interfere. 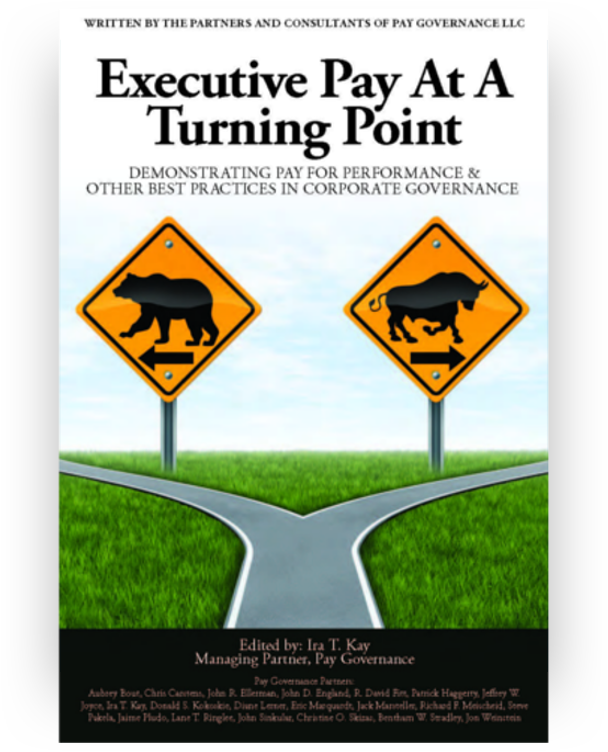 Pay Governance encourages companies to focus on incentive plan metrics that are relevant to their unique business strategies; this may include metrics beyond those evaluated by ISS. Some metrics reviewed by ISS may not be relevant for performance comparisons in certain industries, and some companies may decide that non-financial metrics or strategic objectives are important drivers of value creation for the business. We find non-financial metrics and strategic objectives in use in both annual incentive and performance share unit (PSU) programs. 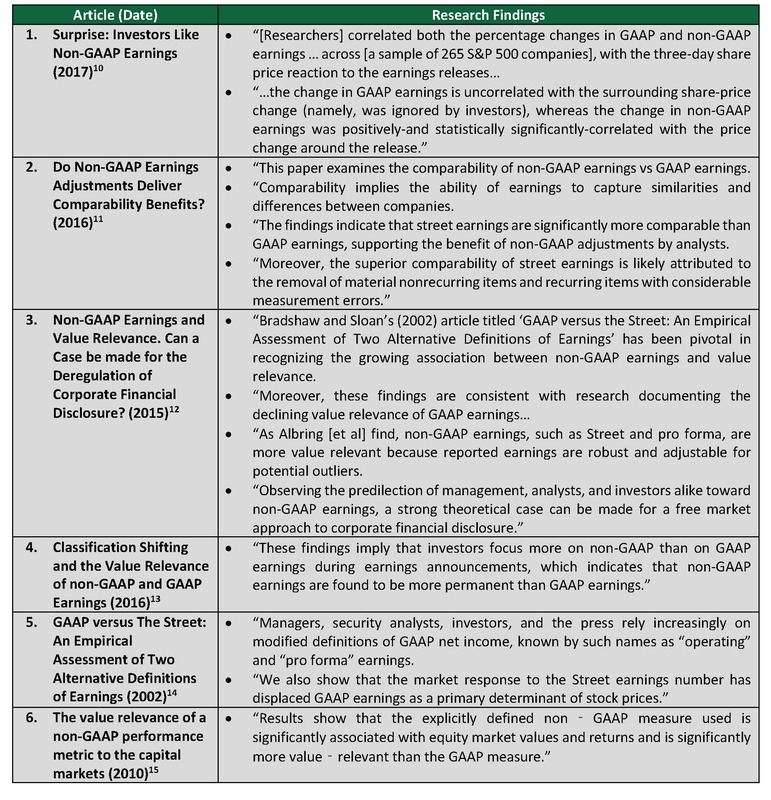 A review of the economic research on this topic (cited in the table below) supports the relevance and use of adjusted earnings over GAAP earnings. This indicates that ISS’ use of GAAP performance could lead to incorrect conclusions on P4P alignment. Companies should continue to use metrics strategically and carefully for their incentive plans and be careful in relying on the financial metrics selected by ISS for its P4P assessments. The preferred metrics may be non-GAAP metrics, strategic objectives, or certain GAAP metrics other than the ones selected by ISS as part of their qualitative and possible quantitative review. In addition to rigorous goal setting, companies should consider a thorough review of the chosen metrics in the context of the link to shareholder value creation, strategy, business model, and motivation of management. Over time, focusing on company-specific drivers of value creation will translate into shareholder value creation, greater clarity to incentive plan participants as to organizational priorities, and positive SOP outcomes. 1. Glass Lewis already uses financial metrics in addition to TSR in its P4P assessment. We focus on ISS because they influence more shareholder votes and have a more transparent model. 2. The predominant quantitative P4P test in the ISS model uses relative TSR exclusively, measured against relative CEO pay from the Summary Compensation Table, which discloses the grant date value of stock and options. This method causes many “false negatives” because it does not utilize realizable pay to evaluate alignment. The new metrics will not resolve this fundamental problem with their model. 3. “Directors’dilemma: responding to the rise of passive investing.” Goldman Sachs. Global Markets Institute. January 2017. 4. Mark Van Clieaf and Karel Leeflang. “The Alignment Gap Between Say on Pay Voting and Creating Value.” The Investor Responsibility Research Center Institute. December 22, 2014. http://irrcinstitute.org/wp-content/uploads/2015/09/final-sop-dec-20141.pdf. 6. Jason Voss. “Non-GAAP Business Performance Measures: An Investor Perspective.” CFA Institute. June 29, 2016. https://blogs.cfainstitute.org/investor/2016/06/29/non-gaap-business-performance-measures-an-investor-perspective/. 7. As advisors to boards of major companies, we also use TSR and GAAP metrics to evaluate P4P alignment. However, our assessment remains qualitative and does not have the regulatory and governance implications of an ISS “against” recommendation or a low SOP vote. 9. The SEC had promulgated specific rules for usage and reconciliation of GAAP and non-GAAP metrics: Non-GAAP Financial measures. U.S. Securities and Exchange Commission. May 17, 2016. https://www.sec.gov/divisions/corpfin/guidance/nongaapinterp.htm. 10. Feng Gu and Baruch Lev. Seeking Alpha. https://seekingalpha.com/article/4060911-surprise-investors-like-non-gaap-earnings. 11. Jancheng Liu and Zhan Gao. Lancaster University Management School. https://ssrn.com/abstract=2878768. 12. Tom Lillywhite. Australian National University. https://www.linkedin.com/pulse/non-gaap-earnings-value-relevance-can-case-made-tom-lillywhite. 13. Ercan Simsek. Erasmus School of Economics. https://thesis.eur.nl/pub/36517/M2-Simsek_361167.pdf. 14. Mark T. Bradshaw and Richard G. Sloan. Journal of Accounting Research. http://sites.fas.harvard.edu/~ec970lt/Readings/April_18/Bradshaw_Sloan_2002.pdf. 15. Susan M Albring et al. Review of Accounting and Finance. http://www.emeraldinsight.com/doi/abs/10.1108/14757701011068066. General questions about this Viewpoint can be directed to Ira Kay, Marizu Madu, or Linda Pappas by email at: ira.kay@paygovernance.com, marizu.madu@paygovernance.com, or linda.pappas@paygovernance.com.